Security Guard Company Software for Tracking, Reporting, Alerts & More. Security guard company software must provide basic guard tour and patrol gps tracking and reporting capabilities, for starters. At the same time though, you can’t hand your officer something designed by a software engineer and expect that they will find it to be user-friendly. The GuardMetrics’ security guard business software was designed by developers that have worked as security guards, and then learned technology in order to simplify officer patrol and tour tracking and reporting. GuardMetrics’ security guard company software makes the administrative side of officer management a whole lot easier. And easier still, you can allow your officers to use their own mobile phones if you wish, because GuardMetrics is designed to work on ANY smart-device! Choosing the right security officer tour tracking app can seem like a daunting task. Security guard services software sometimes seems a-dime-a-dozen, so it really comes down to who will make a reliable patrol tracking system affordable? The GuardMetrics security guard management system tailors the pricing to your company model: Are you a security guard company with static sites with several guards doing tours at each, or a mobile patrol company that covers several sites with patrol vehicles? Or maybe you’re a new security company wanting to enter the market with the right security officer GPS patrol tracking system already in place? Whatever your security company model, GuardMetrics makes guard tour tracking simple and affordable with this user-friendly security officer patrol monitoring system. Call GuardMetrics for a DEMO of this security guard company software! The days of stakeholders accepting scribbled incident reports with paper-clipped photos are gone; at least if you want to succeed as a security guard company in today’s world. Security guard incident reporting software is, therefore, a must. But while you need a way to produce efficient and timely reports for your clients, your officers need a way to get you that data without being “techies”. The GuardMetrics security guard incident reporting software makes the mobile reporting easier than ever, while making the end result better than ever: A real-time, detailed incident report with embedded pics and/or video, branded with your company logo! Simply, the Community Security Portal allows the employees and residents of your clients to send security alerts to your team in real time! This is not technology that many, if any, of your competitors can offer! There is no better way to win new contracts, and keep the ones you have, than to make your stakeholders feel secure. Security guard company software that provides this additional layer of security, branded to your guard services and not available from other area guard businesses, is the way to provide that security, and so grow your business! Post order management is important. Your officers need to know what to do in a given situation and that data can change from post to post, depending on the client expectations. Many security officers, when confronted with an uncommon incident at their post in the middle of the night, have a couple options: Rifle through the drawers looking for his tattered book of post orders, call and wake the boss, or shoot from the hip…none an efficient (nor necessarily safe) option. Security officer post order management software is the obvious solution. 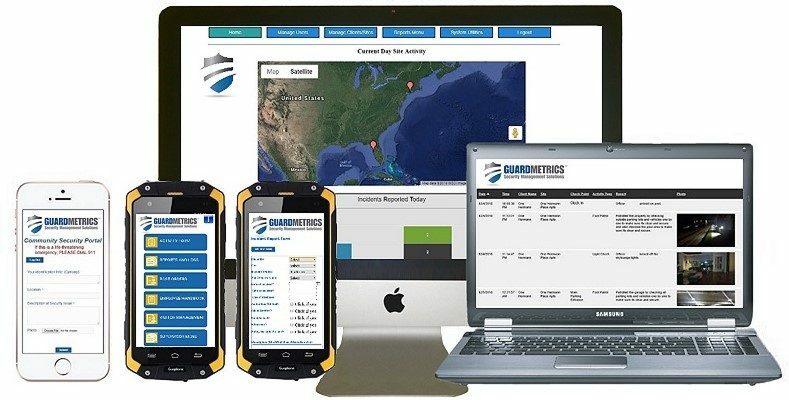 GuardMetrics uploads your post orders into a searchable database, accessible through a big button, right on the home screen of your field officer’s devices. Your guards will have exactly what they need, right at their fingertips, with GuardMetrics’ security guard software. Some stakeholders will need your security guard services to monitor a lobby or guard gate. If you don’t have a ready solution you may well lose some lucrative contracts. Sometimes this need is to keep track of random visitors, and sometimes the need is to monitor the comings and goings of employees, residents, students, etc. Both options are included in the GuardMetrics officer management system; a simple but effective visitor management system that allows you to capture the data and photo of any guests upon their arrival or departure and, the GuardMetrics Facility Access Management system which allows you to issue cards or badges to regular occupants of a facility. These I.D.s can be quickly scanned and render the scanned person’s photo and data to the officer. Both options store the data to be accessed in a report at any later time. Call GuardMetrics, or click here, to discuss this user-friendly security guard company software and what other security operations management services we might help with!